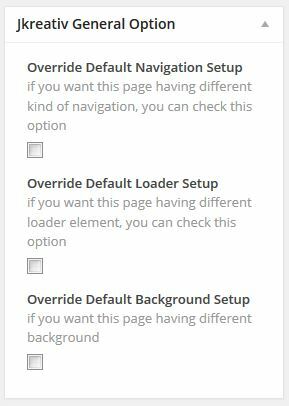 We provide option to override several option that you can find on every Blog Post, Portfolio, or Pages. Incase if you want to use different kind of Navigation, Loader or Background on each page. You can find this option on every blog post, portfolio, or pages on right bottom section on every post type.